Explore the remote wilderness of Chile’s Chiloè island on this full-day tour, including hotel pick-up from Puerto Varas and round-trip transport by ferry from Pargua. 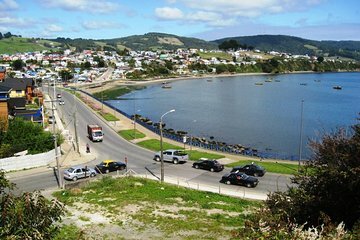 Explore Chacao village, walk the sandy Arena Gruesa beach and tour the historic landmarks and markets of Ancud, then visit some of the island’s UNESCO-listed churches. • Centrally located Puerto Varas hotels. • This tour will only start from hotels and accommodation that are centrally located, it will not start from Cruiser ship or from the Puerto Montt port. Fantástico passeio. Eu diria que completo, contando com centros de artesanato e pontos turísticos excelentes. O tempo para desfrutar das atrações é muito bom, podendo-se caminhar, comer e comprar com tranquilidade. We had a nice day in Chiloe. The trip was safe and the guide was courteous and knowledgeable , We highly recommend this tour.